Have you ever been walking behind someone and approached a closed door to have it slammed in your face because the person in front of you did not hold it for you? Or, had to push in someone’s chair as you were trying to exit the table? As you recall times when this may have happened to you, do you also recall how you felt? 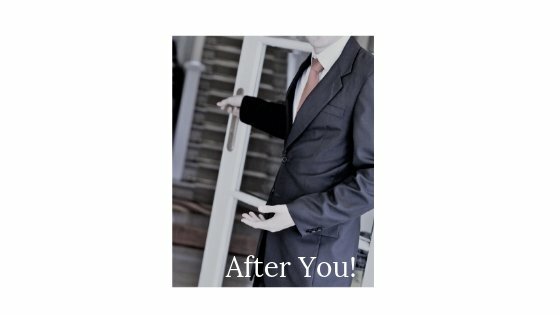 This leads me to the question: Is holding the door for someone or pushing in your chair, when possible, just polite actions or much larger events that may speak loudly about you? Holding the door for someone or pushing in your chair are not just actions, but a reflection of your attitude. When you watch people who just let the door slam in the face of the person behind them, as they walk through the room, they probably live their whole life like that. They have a marriage like that. They have a business like that. They are reflecting how they live their personal and professional life in that few seconds. Likely, you also speak loudly when you do not push your chair in. I have read that during an interview when this happens, Human Resources wants to know, did you think someone else would clean up your mess? Or maybe you did not think someone else may have needed to get by, which is an ethics question. Please be aware that we may speak loudly about ourselves without opening our mouths. Your manners and etiquette are not just polite actions, they are symptoms of your beliefs and values which reflect your attitude. Not holding the door or pushing your chair in are just examples of these outward behaviors that we see as a result of an inward attitude. Not having a conscious awareness of the others around you speaks about your lack of mindfulness for others and your situational awareness of how you are interacting with others. Becoming aware of the little things can make a big difference in your personal and professional life. Let us be constantly reminded of our attitude, by the little actions we do to check ourselves and gauge how we are doing in life…..Let us hold the door. Successful people in business who make it to the top in their field do not get there by accident. They make the necessary investments in learning to be poised and position themselves for success. Part of their success strategy includes non-verbal interaction with others. The non-verbal communication in business is very important and can speak very loudly about you. One component of the non-verbal communication is how you physically interact and your understanding and use of proper seating protocol. In business, seating arrangements can be a subtle, but powerful way to either encourage good relations or create negative, unspoken communication. In America, we tend to be more relaxed or maybe just more unaware when it comes to the proper protocol of seating in business. However, when you step into the international arena, if you are ignorant about seating protocol, you can do irreversible damage. There is a protocol to seating in business that can be effectively used when understood. Here are some American business etiquette guidelines to follow for seating yourself and your clients/guests. If you are the host…position of honor is to your right. Your guest is therefore seated on your right at a dinner or lunch meeting. If there is more than one guest, the most honored guest is on the right of the host and the second highest guest is seated to the left of the host. The third highest is to the right of the highest guest… and so forth. In business, seating is done by rank and not by gender, which of course follows the guidelines of business etiquette which are based on hierarchy. If traveling by taxi, or by limo, the most desired location is in the back seat on the passenger side, which is the honor position in a car. When inviting a team member into your office…invite them in and direct them on where to be seated. The host waits for his/her guest to be seated first. I suggest that you do not sit across the desk from your guest, but rather put him/her next to you on the same side of the desk. This means your office needs to be set up with two chairs on the guest-side of the desk. This positioning eliminates the desk as a barrier between you and your guest. If you interview someone for a job, sit them across the table or desk from you. In this case, the table/desk may be used as a barrier between you and them. If at a meeting, you may want to use a round table for negations or meetings. This eliminates the table “Head” position, which may help to promote team work or equal importance. If the host of the meeting has a guest, the guest is seated on the right of the host. If you are seated at a rectangular table for a meeting and you are the host, try sitting on the side of the table and not at the head. This may symbolize better unanimity, less pretense and more open negotiations. Seating yourself and others correctly is one more way to show your professional savvy, whether you are dealing in business nationally or even more importantly, internationally.